This page is the home to 12 pictures which are from one of my core commercial photography specialisms – construction product photography. Taking photographs of products on construction sites is a specialist area of commercial photography. And one that I very much specialise in. I combine my lifetime of professional construction experience with my photographic expertise. Whatever you need photographing on a construction site get in touch with me by phone, email or the contact page on my website. Product photography on construction sites. My construction photographer page is more about the construction site itself, rather than a product within the site, and is aimed more at main contractors of any size or shape. This page of my website is aimed more at manufacturers, suppliers and installers of products. I also have pages specific to my work as an architectural photographer, interior photographer and interior design photographer. So here are 10 reasons why you should consider me for your construction product photography shoot. I am a current CSCS Managerial and Professional card holder. I have my own PPE. I am equipped to take photographs on live construction sites. I am able to access any part of a construction site. I have equipment to allow me to photograph unusual angles and viewpoints. I am used to working in tight spaces. I understand the needs of suppliers of products. If you want to know about me as a person, then the best place to go to is my photography blog. If, however you want to know more about these 12 images and my construction product photography work, and how I can help you, then read on. KRend is the UKs largest independent silicone coloured renders manufacturer. This is the case study showing one of the images I submitted to the client. I was commissioned directly by KRend to photograph these stylish new houses in Poole, as well as a nursey in Portsmouth. The two shoots were completely different, but of the same product for the same client. It might sound easy photographing render but there is quite a lot more to it than meets the eye. The render was white, so had to appear white. Which on large flat areas is no mean feat, needing all the technical image capture excellence that my Canon 6D gives me. That and some precision image processing in Lightroom and an amount of tidying up in Photoshop. The images looked great and the client was delighted – a good job all round. Another big name on the construction product market is Catnic, who make lintels. For those non-technical people those are the things that sit over the windows and take the weight of the wall above. I photographed the Acheson Construction site at Corfe Castle, where a new Doctors surgery was being constructed. The image featured on this page is one of my creative mages, with a dark overall image with the colours removed apart from the orange in the Catnic label on a lintol on the construction site. I also selectively brightened the label on the lintol. Another big name, and a massive construction site. Rockwool. I was commissioned by Wildwood PR to photograph the Rockwool products being installed as over cladding on enormous tower blocks in Portsmouth. The product in question was the insulation, which was fitted within the Metsec cladding system before being covered with a waterproof membrane, boarding and the external cladding panels. This was a truly enormous construction refurbishment project, with Keepmoat being the main contractor. On this shoot, I produced a wide variety of images, including a big panoramic picture of the entire rear elevation from ground level. The picture on this page was photographed from a first-floor car park, and shows the before and during views, and also gives an idea of the scale of the project. Now a tricky thing to photograph is paint. White paint on plastered walls. Hmmmm. Tricky one. The manufacturer of the paint was Dulux. I know another huge name in the construction industry, well decorating of any kind of building anywhere market really. Another complication with this shoot was that it was on stairs in occupied tenanted blocks in Dorset. Bearing in mind I like to use my tripod for every commercial image I take this was certainly a challenge. Both in terms of the space available and people wanting to get by! Thankfully for me these things are routine challenges which I deal with on a weekly basis. More specialist product photography. Gerflor flooring. 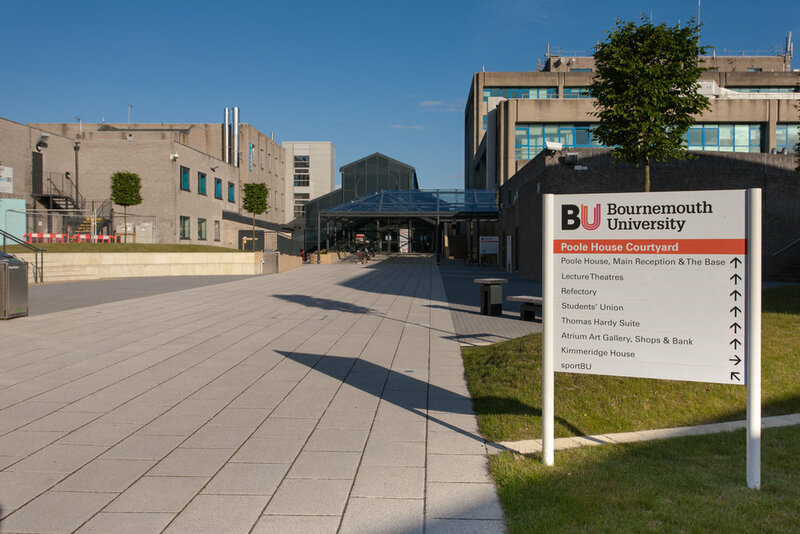 This floor was installed as part of the overall refurbishment of sportBU, the fitness centre at the Talbot Campus of Bournemouth University. The refurbishment was carried out by Kier Construction. This picture was taken from a scissor lift, which was carefully driven in through a conveniently placed fire door right by the corner with level access externally. The scissor lift drove over protective ply placed on the recently laid and marked sports hall flooring. Taking photographs in circumstances like this is challenging, as I had this one opportunity to take this picture, immediately after completion of the refurbishment when a scissor lift was booked to carry out other repairs. I managed to get access to take this picture before the lift was driven off site and the hall put back into full use. And I learned all about the complexities of marking a sports hall floor properly! Yes, modular buildings. Well they are products. And ones that are surprisingly common these days as people try to provide additional space cheaply, quickly but to a high standard. I was commissioned to photograph three new sites with modular buildings provided by Elliott UK. The picture I have included is a branding shot. A crisp, simple picture with the Elliott logo on one of their recently completed modular buildings. Branding is very important in product photography, and one of the things I like to do is exclude everything but a part of the product and the branding – the name and the logo. Now this was an interesting shoot. 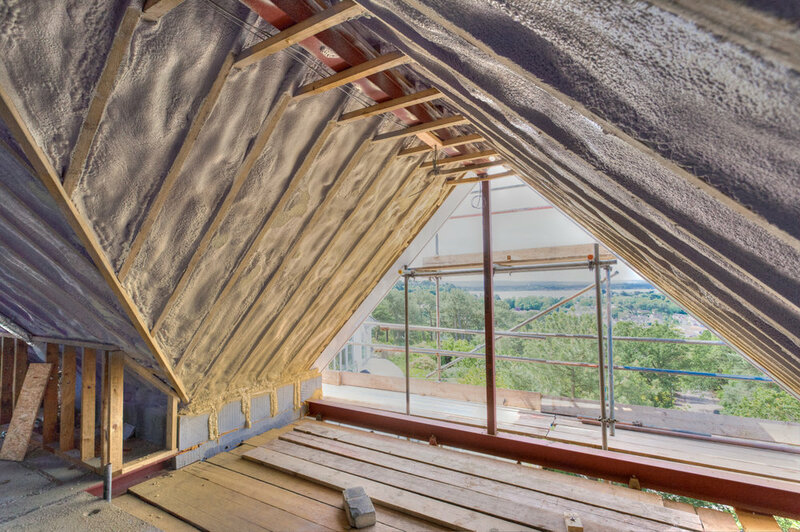 Walltite Spray Foam Insulation by BASF. A construction site in Poole. The insulation was being sprayed under the felt before being enclosed with plasterboard. This was a stunning new development, and I managed to capture a picture of the insulation with a view through one of the window openings towards the sea. I was trying with this shot to place the product in it’s context, which was being built into a luxury house with a sea view. The original image had a brick and some other debris on the floor, which were still in the original images included on this web page, but which I have since removed. I would not dream of issuing an image like that to a client these days!! But all shoots provide new learning and things that help me develop and improve the quality of my commercial photography work. 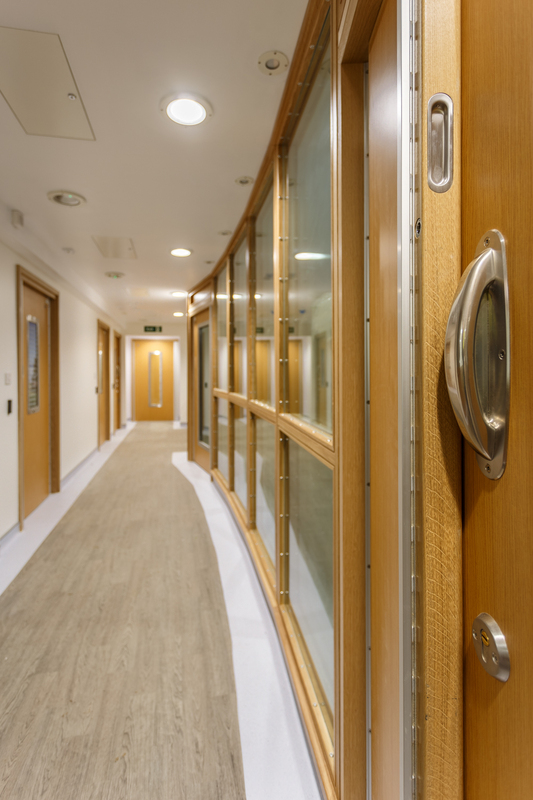 Kingsway anti-ligature doors installed in a hospital. This image is from a commercial shoot where I photographed some specialist doors on a live construction site. This was a construction product shoot for the company Kingsway, “Experts in door sets and hardware for mental health”. Product shoots on live construction sites can be challenging, and always take longer than intended! The main contractor on this hospital extension was Brymor Construction. I was commissioned by the manufacturer of these specialist door sets to photograph the doors just before completion of construction works, which was also immediately before the building went live. 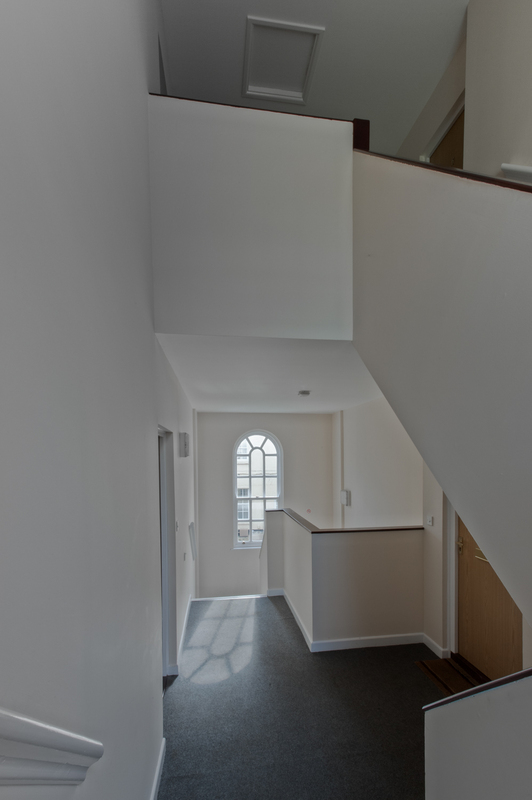 Once the refurbished building was handed over to the client access would not be possible. The time constraints at the end of a construction project often dictate what I can photograph and when I can photograph for the client. This picture shows both one of the products in detail, the door handle, as well as the range of products in the context of the corridor in which all these doors and frames have been installed. This is a detail shot if ever there was one, and the only picture on this page taken with my Canon 100-400mm lens (long since retired). I was commissioned by the architect Andrew Stone to photograph the new dome to Chideock Church. This stunning church is in a fantastic location in West Dorset, which was an absolute pleasure to photograph. The interior of the new dome was stunning, but the tiles made a fantastic, abstract, graphic picture. If you go my interior photographer page you will be able to see a picture of the inside of the new church dome once I have updated the images on that page. 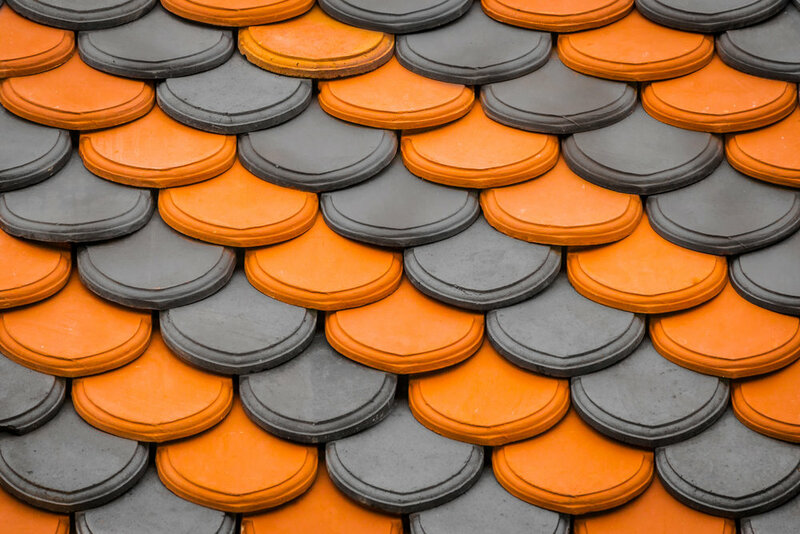 The shoot was of the new dome, but this detail shot was an important one, as the tiles were specifically designed for this location. Such an important detail. When I am carrying out construction product shoots I always try to include detail shots of the products, as well as images showing them in their context, as well as pictures from different angles and views. Paving is a great subject to photograph. Normally I am asked to photograph paving soon after completion of a construction site. I am lucky to get to see construction sites not long after completion, often when the premises are occupied and in use, which is always great to see. Buildings are about the people who use them, and there is nothing better than seeing this. This picture was taken at a site recently completed by Junnel Homes. The paving, manufactured by Tobermore, forms the access into this lovely, small housing development, and the individual driveways. This kind of product photography needs good weather, so once I have been commissioned I basically wait for sunny weather. Another issue I have to contend with is the time of day, especially in the winter, as I need the photographs to make the best use of the sunshine without having shadows on the paving. I have also included an image taken at a holiday home in Kent where the paving was used to form the driveways to individual holiday homes.